Validation can be so sweet! While at the CASE Board of Directors meeting, the CASE Executive Committee members led activities designed to solicit input from the BOD. One of those activities was jointly led by Professional Development chair, Kindel Mason (ID) and Unit Representative Emilie Maule (IA) on what were the critical issues they wanted to see CASE address. The issues the BOD identified as number one and two were: MTSS/.RDA and Legal issues. Now what is amazing is CASE had already planned and secured top speakers for the 5th annual Hybrid Conference to be held Feb. 11 and 12 on both of these topics! Talk about validation, we are so excited to have what we thought was a need actually BE the very thing CASE leaders from 34 different states indicate was their top issues! The BOD did break these topics out into other smaller issues and those have already been sent to Dr. George Batsche and Julie Weatherly, Esq. Dr. Batsche will be leading the Thursday session: Actualizing the Practice: Identification of Students with SLD within an RtI/MTSS Framework — Accurate Eligibility and Effective Instructional Practices. Dr. Batsche will be stressing the need for multiple team members from across varying roles so be sure to sign up for a Virtual site and bring lots of cross stakeholders to the Thursday session! Julie Weatherly, Esq. will be doing Legal Issues: Actualizing the Promise on Friday. Where could you get a full day of legal updates for your team — as many as you can get in as big of a room as you can find for the price of just one registration? This day is one you will definitely want your general education administrators to be present for and since you can do this virtually, you don't have to "send" them out of district! The Virtual option of our Hybrid is perfect for truly effecting sustainable change on a shoe string budget. Your team can get the same training from national experts without spending the travel dollars and the out of district travel time! We have listened to your assessment of the virtual portion and we will be building in some Think-Pair-Share time and other activities to help your team maximize the time spent together! Start building the excitement for this mid-winter professional development event. When you register as a Virtual site, we will send you customizable flyers and additional hints for getting the most out of your site! Of course we would also love to have you attend onsite at the lovely Beau Rivage hotel right on the water in Biloxi, MS at just $109/night! Go to the CASE website for more information and to register for either the Virtual or the onsite! Speaking of excitement... the location for CASE night has been set! We will be going to Grant's Farm and visiting with the Budweiser Clydesdales! I don't know about you, but those commercials make me cry more than a Hallmark commercial! The Super Bowl is the one time we don't fast forward through the commercials! This CASE Night should be one that will offer so much in adventure and time to network! Remember, tickets go on sale February 1 so mark your calendar — they do sell out! Special thanks to our sponsors STAR Autism Support and C8Sciences. Stay tuned for more information! Last week, the Poll asked what is the number one purpose of CASE? 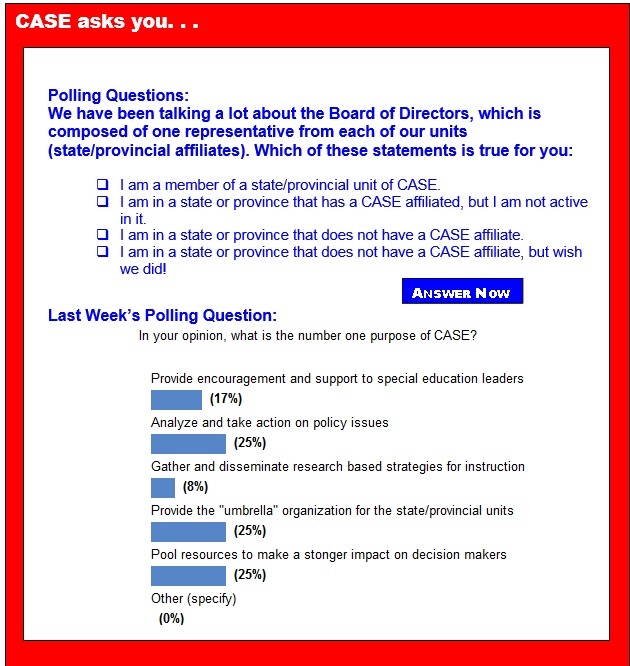 There was a three-way tie at 25 percent for the number one purpose: Analyze and take action on policy issues, Provide the "umbrella" organization for the state/provincial units, and Pool resources to make a stronger impact on decision makers. In second place at 17 percent of those answering the poll was Provide encouragement and support to special education leaders. Coming in at last place with 8 percent was Gather and disseminate research based strategies for instruction. I hope you think we are doing a good job in all these areas. If not, send us some feedback on how to be better! Thanks for all you do to make every day a day to learn for so many! Please support these colleagues! Without them, we could not offer such quality event! 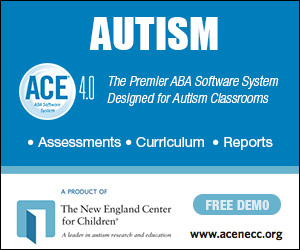 C8Sciences, Classworks, eSped, PresenceLearning, Promethean, STAR Autism Support, and vizZle. Bayes Achievement Center (BAC), Edupoint Educational Systems, Gersh Experience, Houghton Mifflin Harcourt, LRP Publications, Scientific Learning Corporation, Stetson & Associates, and Winsor Learning, Inc. Researchers have spent ample time determining which variables influence school outcomes. Parent and family involvement is one such variable that has been found to be important to school outcomes. Parent involvement has shown to predict academic engagement independent of cultural differences; however, motivating and encouraging parent involvement may differ across cultural groups. Educators should evaluate how best to encourage parent involvement for families on an individual basis. Researchers have also found that parental involvement is especially important for students with behavioral issues. When educators determine best practices to improve school outcomes for students, especially students with behavioral issues, they should consider how they might collaborate with students’ families. Thanks to educators like you, the Hour of Code keeps changing the world. This year can be a turning point for computer science in our schools, with new tutorials, new prizes and you. Together, we want to reach 100,000 classrooms worldwide. I hope you'll join us to prove anybody can learn, and every young person deserves to learn how to build technology that will impact everything in their future. ?Sign up for the Hour of Code. What is the Hour of Code? It's a grassroots movement that's already introduced 100 million students to the basics of computer science. Participate with any one-hour coding activity that students love — no experience needed! New prizes for every organizer. Every organizer will receive a gift card to iTunes, Amazon or the Windows Store as a thank-you gift. And you can win $10,000 for your school. Details. 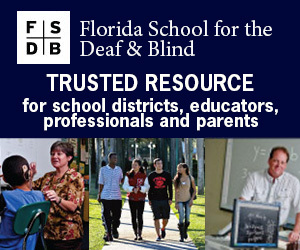 Tell Congress today to increase FY 2016 Funding for Special and Gifted Education! Will a decline on the Nation's Report Card hurt Common Core?